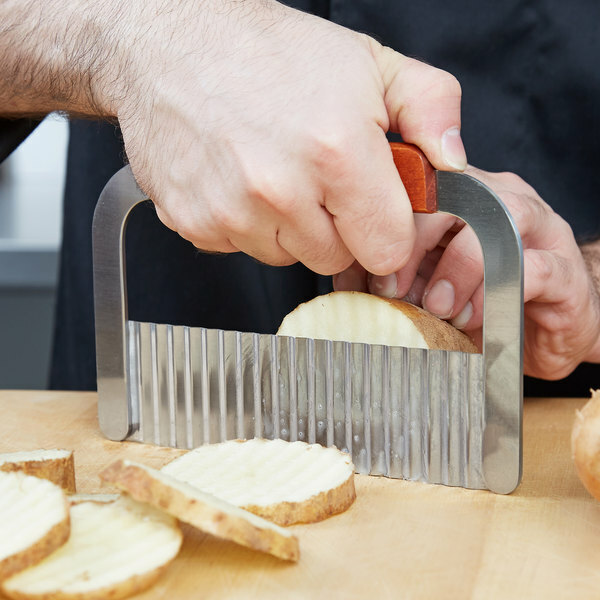 This 7" crinkle knife is a great way to quickly cut French fries, carrot slices, pickle chips, and other garnishments! It boasts a stainless steel frame and blade that are held securely together by brass rivets, as well as an ergonomic wooden handle for exceptional comfort. Whether you want to dress up your plate with interesting garnishes or create an added element of visual appeal to fruit and veggie servings, the blade's serrated edge is sure to produce the results that will get your customers talking. Kids love it when I use it. The handle design makes it easy to use. It has held up well to the day to day use. Crinkle Knife is perfect for our potato wedges makes our fries look better. I found myself saving time using this handy tool instead of a chefs knife. can also be used to chop salads etc. 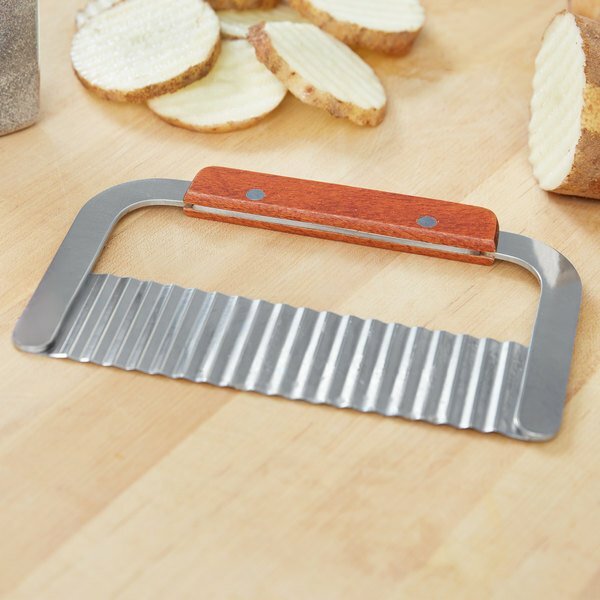 We use the crinkle cutter with our baked sweet potato french fries. It give the final product an appealing look and is easy to use. I appreciate the design on this 7" Crinkle Knife. 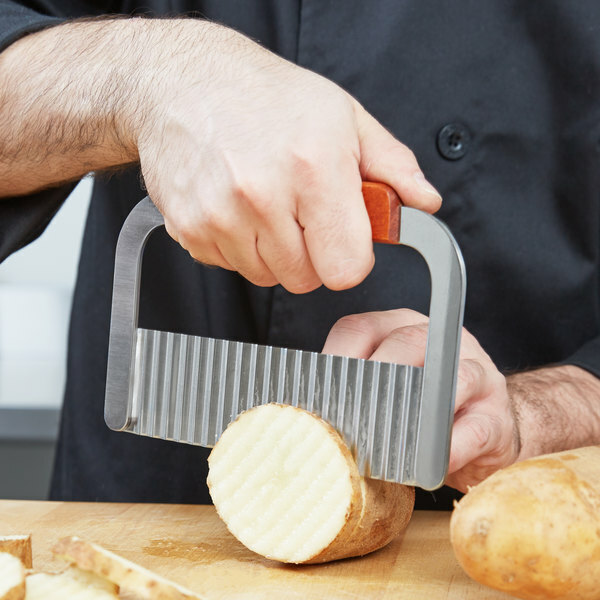 In cutting position, the handle is on top of the blade, which allows leverage to press down on the tougher-to-cut potatoes. I own another crinkle knife with the traditional design of the handle in-line with the blade and it is really hard to use on cutting potatoes. The only thing I would like for this product is to have the handle rubbery for a more comfortable grip. Good value for the quality. Its sturdy and easy to clean and does its job well. The blade is just the right thickness that will slices through vegetables; fruits or even cheese cake easily. If your café or restaurant offers crinkle cut fries this 7 inch crinkle knife makes it easy to produce such items. 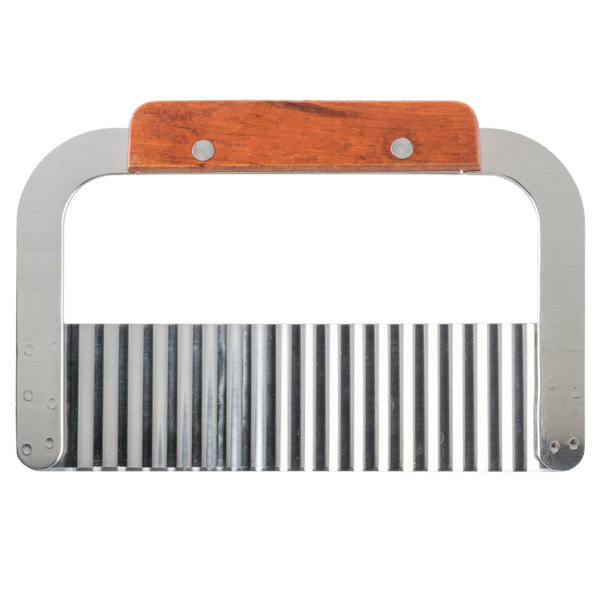 The handle is made of wood and the blade is made of durable stainless steel. This tool should be hand washed to keep it looking new and in good shape. This is exactly what I was looking for. I use it for fruit, mainly melons, and also for adding texture to a frosted cake. It's sturdy-ish, but it will start to hurt your hand if you use it for too long. This stainless steel crinkle knife works very well. I have used it for all kinds of veggie garnishes!! I would highly recommend this sturdy and precise knife. sturdy product! easy to clean and does its job well, is thin, but slices through vegetables easily, use it for crinkle cut carrots all the time. I use this crinkle cutter for multiple items. Especially when I make cold process soap, it puts a nice crinkle cut on the soap. I leave one side of the soap smooth and the other crinkle cut!! Nice crinkle cut knife that has mild crinkles, allowing for quicker chopping that then knives with deeper crinkles. Middle handle allows for more leverage over the knife. Works great for cutting all kinds of vegetables and easy to clean to reuse saving food preparation time. We would totally recommend this product for any kitchen. Nice long, sharp blade. It is good for cutting vegetables such as carrots and cucumber. I wish there was a bit more "wave" look to the crinkles. Wish this knife is actually smaller but we are fine with it. Makes crinkled potatoes in no time. Blade is heavy aluminum and it is quite sharp. Nice tool to have for quick cuts on vegetables to look nice for show plates. This is a little time taking for making fries. This cleans up easy and is durable. this is a great little crinkle knife. ive been using it almost daily for a while now and no issues. works great cleans fast great buy. This is a decent little tool to have. I dont reccomend using it to make french fries though, you'd be there all day! but nice for making vegetable garnishes for drinks.